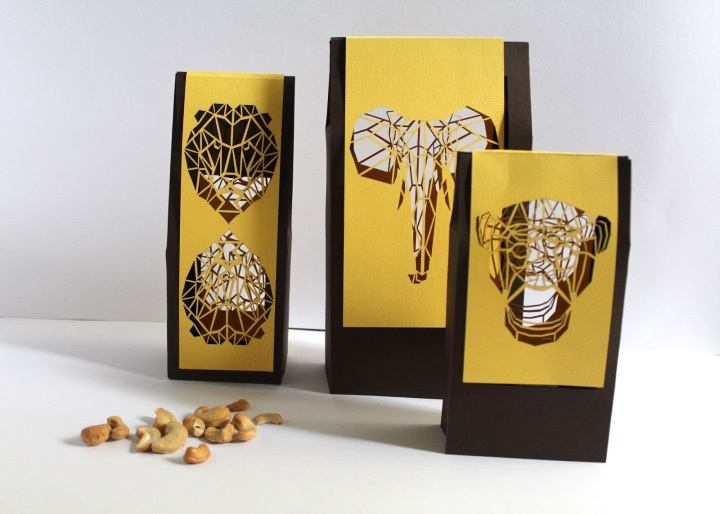 Stepping away from the typical uniformity of snack packaging, Ayala Tal, a Visual Communication student from Shenkar, Israel, came up with a little twist in the design of nuts and peanuts pouches. For those interested in branding and package design, this unique idea is worth considering. As part of a course assignment, the packages are made of paper in two contrasting colors. 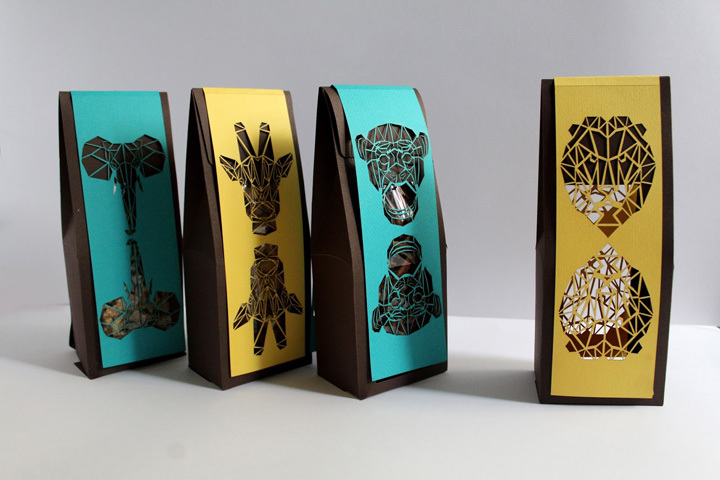 They boast four laser-cut animal shapes rendered in a stylized geometric style: giraffe, lion, monkey and elephant. The delicate cutouts create four dainty designs that attract the eye by creating contrast. The see-through construction gives the consumer the chance to evaluate the product before buying, and creates an appetizing presentation. 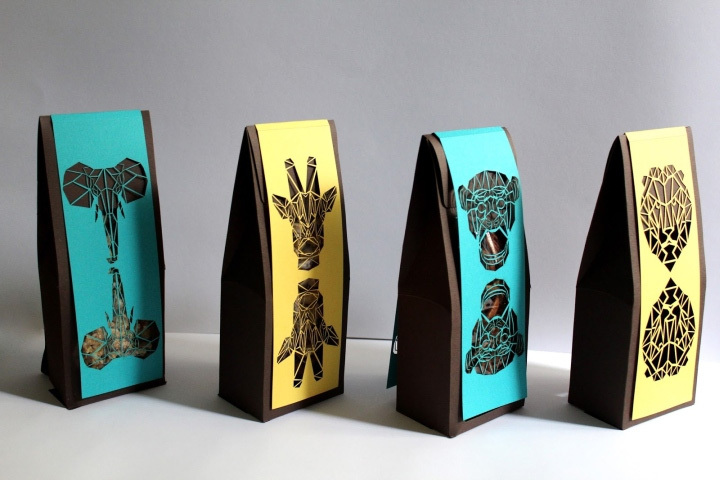 Each package combines a neutral brown color with a vibrant one, for maximum visual impact. The front colors found inspiration in those specific to African dresses. The colors are deep and dynamic, while the lack of additional patterns allow the animal cutouts to stand out. 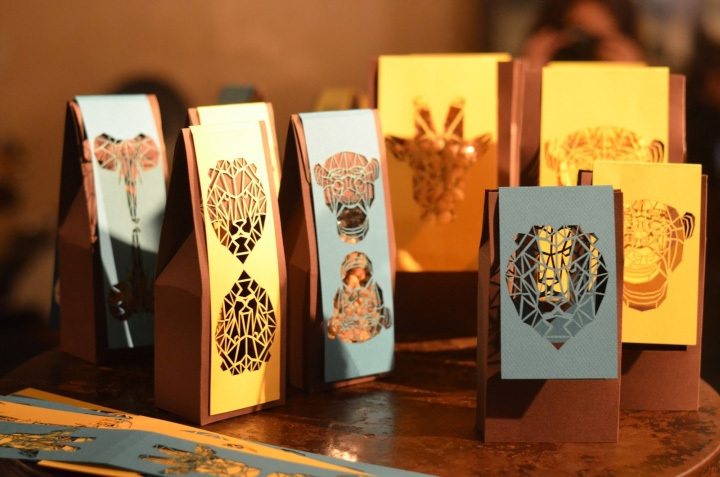 What is different about these packages is that the design itself offers a unique clue to the products inside. 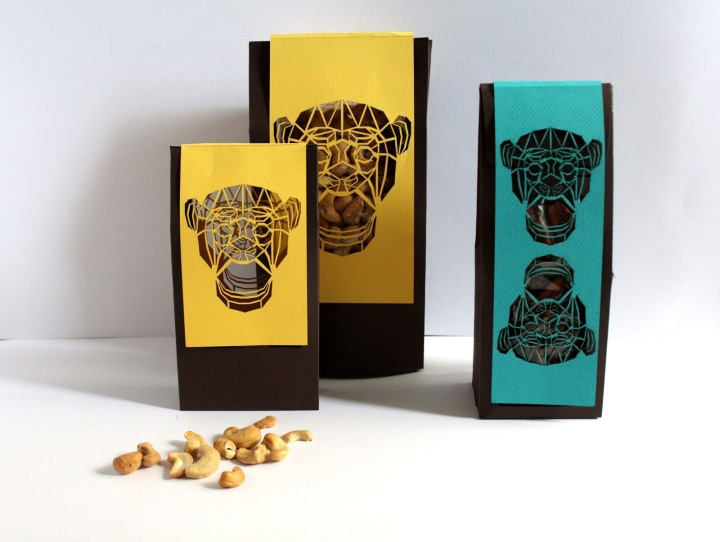 The packages are designed in different sizes, and the animal shape on each of them suggests the amount of nuts and peanuts inside. For example, the elephant pouch is wider than the monkey one, and the giraffe package taller than the lion one. These differences – directly inspired by the ones in the natural world – offer an immediate visual clue to the quantity of nuts and peanuts housed by each pouch. Combining impactful colors, the use of contrast and transparency, and visual clues that make the products not only fun and recognizable, but also easier to choose from, the packages by Ayala Tal may serve as an excellent source of inspiration in branding and package design.